Years later, the best webcam remains a great choice. Simple performance strung with an affordable price. The Logitech C920 has reached a legendary status in the webcam arena. Six years after its release, it’s still cemented as one of the best webcams you can buy. Before I delve into the C920’s performance details, let’s pay homage to its build quality. Yes, it isn’t nimble, yes, it isn’t extravagant, but it is well-made. Protecting the lens is a panel of glass mounted on a durable plastic shell. Its cable, while not detachable, is sheathed in a thick coat of rubber. Overall, I wouldn’t hesitate tossing it into my backpack. The C920 uses a plastic clip to grab on to your monitor. The clip doubles as a decent stand when you need to situate it on your desk. At the stand’s underside is a standard tripod mounting hole, convenient for when you need a steadier platform. I wish the stand was detachable, though, as it would make packing considerably easier. Setting up the C920 involves plugging it in via USB and launching your video app—complicated, I know. Once set up, the C920 can capture in a variety of resolutions. Most of us will set it to record in 1080p at 30fps, but it also supports recording in 720p at 30fps. Field of view stretches out to 78 degrees and can be narrowed down if you want more focus for when you’re streaming alone. Give it ample lights, and the C920 puts out strong image performance. Details are crisp, clear, and colors are vibrant. Additionally, its autofocus is speedy and accurate; despite me pacing around in my room, it never failed to properly lock focus no matter where I moved. In dim environments, the C920 relies on Logitech’s RightLight 2 technology to maintain image clarity. RightLight 2 automatically adjusts brightness, contrast, and color settings according to the detected lighting condition. The algorithm works great in practice, producing stellar images in low light. Keep in mind, however, that this is not the best we’ve seen; that honor belongs to the Logitech Brio. Compared to the Brio, the C920 shoots a smudge darker under the same lighting conditions. With that said, the Brio is more than double the cost so we won’t dock too many points here. The C920 excels in nearly every aspect of our image quality test...almost. While it ticks off most boxes in detail and color, its auto white balance is finicky at times. The auto-calibration applies a blue tint, giving the images a cold tone. Furthermore, it distorts color a little by making red areas appear magenta. This effect is most prominent in low lighting. Thankfully, this issue can be fixed through the Logitech Camera Settings software. It offers easy-to-use slider adjustments for brightness, contrast, color intensity, and white balance. With that said, changing the white balance—something you’d likely want to do—involves turning off its auto calibration. This means that if the color of the lighting changes (e.g. from daylight to room light), you’ll need to manually readjust the setting. The integrated stereo microphone is on par with an average laptop microphone, in other words, just passable. My voice sounds tinny and a bit scratchy. If audio quality is important, definitely use a dedicated mic whenever possible. Many streamers employ a background replacement software when streaming, so while Logitech doesn’t list the C920 as an officially supported device, I tested it out with ChromaCam anyway. To my surprise, the C920 works beautifully. Rarely do background items manage to slip through. The C920 went for $99 upon release, but it hasn’t been listed at that price since 2013. Today, it can frequently be found for $50 or less. In contrast, its replacement, the Logitech C922, costs $89. Although the C922 does have better white balance, this slight upgrade isn’t enough to justify the premium. 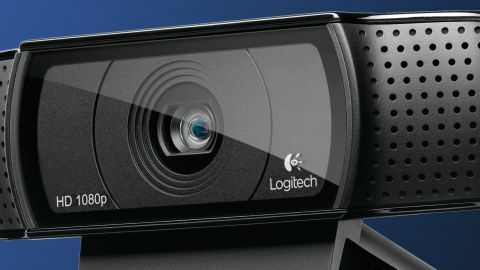 Until Logitech ceases its production or a higher value product arrives, the C920 will remain as the best overall webcam.